The sod webworm can be a destructive insect, particularly on lawns or in parks. Damage first becomes apparent in spring or early summer as small, dead patches of grass in an otherwise healthy lawn. By midsummer, large sections of the lawn may be destroyed by the sod webworm caterpillars, which prefer sunny areas. Webworm damage is particularly severe in droughty conditions, in part because the turf is less able to recover from caterpillar feeding. Damage is usually most apparent in July and August, when temperatures are highest and cool season grasses are not growing vigorously. Affected areas recover slowly from webworm feeding, and often are overrun by weeds. Webworm activity is sporadic and often does not cause enough damage to warrant treatment. There are several species of webworms which attack turfgrass in New England. The adults are buff-colored moths which are 1/2- to 3/4-inch long. They sometimes have a small, dark line on the top of each wing cover. Two small, fingerlike projections are visible at the front of the head and look like a snout (for this reason sod webworms are sometimes referred to as "snout moths"). When the moth is at rest, the wings wrap around the body, giving it a tubular shape. Adults will fly upward when disturbed by movement (a person walking by, a mower approaching), and will move a short distance before darting back into the grass. The caterpillars (the stage that actually damages turfgrass) are up to an inch long when fully grown, but are very small (1/8-inch long) at the beginning of their development. The color pattern varies with the species and plant source, but most webworms are greenish, grayish, or brownish, and usually have dark spots scattered along the body. In most species, the head capsule of the larger stages of caterpillars will be relatively light brown with some dark markings. Some of the sod webworm species present in New England complete one generation per year, while others complete two generations per year. Most species spend the winter as large caterpillars in "hibernacula," which are tent-like structures that larvae weave to provide extra protection against temperature extremes, a few inches below the surface of the lawn. When the caterpillars become active again in the spring, they feed for a short period before pupating and emerging as moths. Female moths flit around just above the surface, popping out individual eggs as they fly. The eggs, which land in turf, hatch about a week later into small caterpillars. These begin feeding almost immediately on the leaf tissue above the thatch. Caterpillars go through six to ten molts as they feed and grow. Because there are several webworm species present and because weather conditions vary from one year to another, there appears to be considerable variation in development of webworms. Eggs, small caterpillars, large caterpillars, pupae, and adults can be found in turf at any given time in July and August. Sod webworms feed on a variety of grasses. While they often thrive on lush, healthy grass, this is also the kind of grass which is most able to withstand insect stress. In any case, webworms commonly attack Kentucky bluegrass, perennial ryegrass, fine fescue, and bentgrass maintained at a variety of mowing heights. Webworm damage starts as small yellow or brown patches in the leaf blades in lawn areas. As the caterpillars feed and grow, the patches gradually increase in size. Caterpillars are nocturnal, so they will not be noticed on the surface during the day. However, if a turf manager checks the area and teases the turf blades apart gently, he or she will notice tunnels or burrows in the thatch. Often these burrows will be lined with green, pellet-like matter. This is "frass," or caterpillar excrement. The easiest way to determine whether sod webworm caterpillars are present in a turf setting is to conduct an irritating drench or soapy flush. This is done by putting one or two tablespoons of lemon scented liquid dish detergent in one or two gallons of water and pouring the soapy solution over an area which is about two feet on each side. The caterpillars will be irritated by the solution and will wriggle out of the thatch and up to the surface, where they can be counted. Most caterpillars will respond to the soapy solution within two to five minutes. 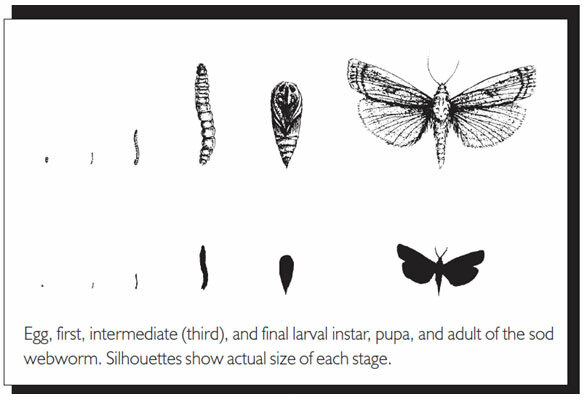 This technique is particularly helpful for determining what stages (sizes) of caterpillars are present. The soapy flush and the visual inspection should be conducted on the edges of the affected patches, because this is where the caterpillars will be concentrated. (They will have already moved out of the centers of the dead patches.) Rinse the area after completing the drench to dilute the soap and diminish the likelihood of damage to the turf. Webworms are relatively susceptible to several turf insecticides, as well as some biological control agents. The key to successful control is to apply a management material when most of the caterpillars are still very small (around 1/4-inch) if possible. Because webworms are nocturnal, traditional insecticide applications should be made as late in the day as possible. This will ensure that the insecticide is as "fresh" as possible when the caterpillars leave their burrows in the evening and begin foraging on the surface. The material should be watered in lightly, just enough to move the insecticide off the blades and into the upper thatch. If possible, the area should not be mowed for one or two days after application. One guideline for application timing is to make an application two to three weeks after a peak in moth flight activity. This allows time for the moths to lay eggs and for the eggs to hatch into small caterpillars, which are the most vulnerable stage. There are several biological control options which appear to work reasonably well for controlling sod webworms, as long as the biological control agent is handled properly and applied with adequate water and irrigation. Bacillus thuringiensis var. kurstaki, a bacterium which produces a toxin and paralyzes the gut of the caterpillar, is available commercially for use on turf. The bacterium will not kill the caterpillars quickly, but it does paralyze the gut shortly after exposure, so feeding activity slows soon after application. An entomopathopenic nematode, Steinernema carpocapsae is able to seek out caterpillars and penetrate the host, where it introduces a bacterium. This bacterium causes a massive infection in the host caterpillar. The nematode then reproduces inside the insect cadaver and moves on in search of new victims. Field trials indicate that this nematode, available commercially in a variety of formulations, can reduce caterpillar populations significantly. The nematode is very vulnerable to desiccation, so applications should not be made at mid day and should be watered in (at least half an inch if possible) immediately after application. If a turf area is scheduled for renovation, endophytic turfgrasses (certain cultivars of perennial ryegrass and fescues) should be considered. The endophytes provide the turfgrass with a level of resistance to caterpillar activity.